Rear monoshock with adjustable preload & rebound damping. 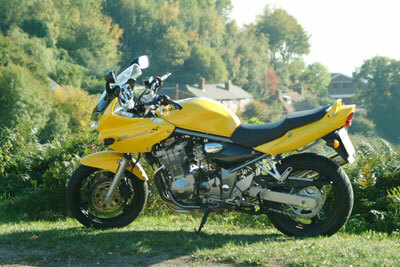 If ever a bike could be considered a victim of its own success, the 600 Bandit is probably it. When it arrived on the scene it was a revelation. There was, quite simply, nothing like it. You could buy proper sports 600s, of course, you could buy sports touring 600s and you could buy incredibly dull commuter 600s. But the Bandit was something else entirely. A sensible looking hooligan bike. A psycho in a suit. Call it what you will, the Bandit gave a combination of spot on handling, eager engine and styling that couldn't offend even the most puritanical, and delivered it all for a price that made the opposition really sit up and take notice. Within weeks you couldn't move for Bandits, especially around the urban environment where they were the ideal commuter with spirit that people had been looking for. But competition is fierce, and as soon as a brand new niche is created, if it looks like a seller then everyone else will get on the bandwagon as well. Which is bad news if your market leader happens to be based on an engine that's years out of date and is built as well as it can be for the price. Especially when the opposition have better raw materials and a larger market share. And so it came to pass that the Bandit gradually fell from favour, especially among that most fickle of things, the motorcycle press, replaced by newer, shinier, slicker bikes from other manufacturers. And that is really unfair. accept that this is a very subjective opinion. I hopped on it to do my standard 80 mile test circuit. It cheerfully handled everything I threw at it, clearly had plenty in reserve and was a lot more fun to ride than I expected. If I'm going to be completely ruthless about it, I would have to say that the engine is showing its age a little in that it is both a little rough at high revs and a little flat further down. 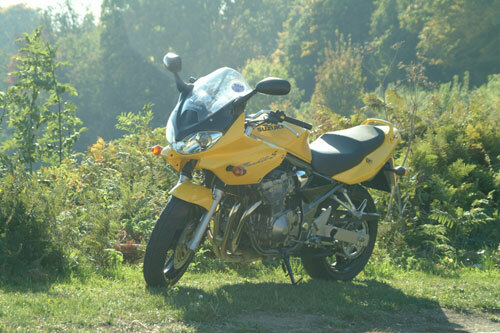 It feels very much like a second generation sportsbike engine - something like an early GSX-R - for the simple reason that it is exactly that. It still has carbs, but they are well set up and perform faultlessly. It has a sportsbike gearbox - smooth and precise and just crying out for clutchless changes - and in fairness what some would call rough and maybe a little primitive others would call characterful. I was lucky in that the extended summer weather continued during this test, but riding the 1200 earlier in the year in pretty grotty weather I can vouch for the effectiveness of the fairing. A brief stint in the dark showed that the headlights, while perhaps not the most attractive ever to grace the front of a motorbike, do exactly what is required of them and illuminate the road very nicely indeed. Mirrors, a particular bugbear of mine, are clear, wide, blur free and show a pleasantly empty road behind me. Riding the Bandit is as involving or uninvolving as you choose to make it. Riding back from a very boring meeting, tired and with my mind working on other things, the Bandit was a comfortable companion, easy to get along with and happy to just take the road as it came. Attacking a favourite set of bends, the Bandit became taut, alive and as keen to play as I was. It isn't a super focused sportsbike, but that doesn't mean it can't boogie when asked. We owe a lot to the Bandit. We owe the proliferation of entertaining middleweight multi-purpose bikes to the Bandit. We owe the current, ultra competitive pricing policy relating to those same bikes to the Bandit. And probably a lot of you owe the fact that you are now capable motorcyclists to the 600 Bandit you got after passing your test. There's little to say about it that hasn't been said before, but I will endeavour to summarise what I think about the 600 Bandit in a few words. It's fast enough to be fun. And slow enough to be fun as well. It handles well. It's comfortable. It's (dare i say it) practical. And finally it's astonishingly good value for money. In short, if you are looking for a middleweight that does all of these things and is versatile enough to fill most roles expected of a road bike, you could do a heck of a lot worse than a 600 Bandit. 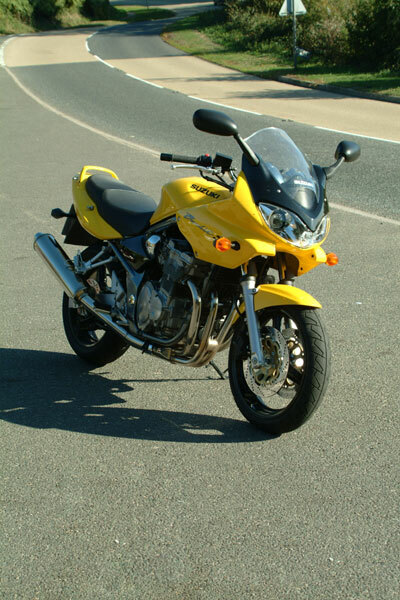 Read external Suzuki Bandit 600S reviews on ciao.